“…The illustrations have not changed from one book to the next. The kids have big bright eyes and represent a multicultural world. The illustrations have become so standardized readers of Cannon’s books could pick out the kids from any scene. This is not a bad thing; these kids are all positive influences in their stories. Observant readers will find some of these characters joining Robert and Kait at school, often with one of Cannon’s previous books in hand. 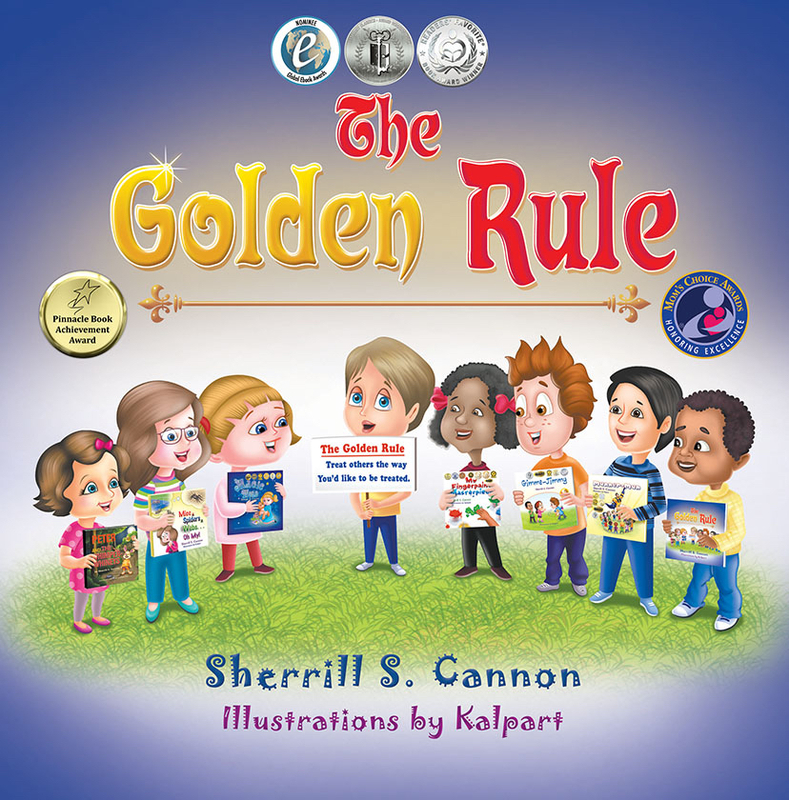 The Golden Rule is Cannon’s eighth picture book with her Grand View Elementary school students. Written in rhyme, with a long block of text on the left and an illustration on the right side of each spread. The writing is also familiar by now to loyal readers. A ten or eleven beat meter in an eight-line verse graces half of the spread. The rhymes rarely fail though sometimes the lines can be confusing or grammatically incorrect for the sake of the rhyme. Despite this, Cannon always gets her message across in a meaningful way. This entry was posted in Award-Winning, Behavior, Bullying, Children's Picturebook, Consideration for Others, eBook, Golden Rule, Manners, Picture Book, Review, Reviews, sherrill s. Cannon, Uncategorized on October 26, 2016 by Sherrill S. Cannon. Let’s hope he shares Manner-Man with others!! This entry was posted in Award-Winning, Behavior, Bullying, Children's Picturebook, Consideration for Others, Manners, Picture Book, sherrill s. Cannon, Superhero on October 19, 2016 by Sherrill S. Cannon. Other Sherrill S. Cannon’s children’s books on display at the Book Fair are Mice & Spiders & Webs…Oh My!, Manner-Man, Gimme-Jimmy and The Magic Word. This entry was posted in Award-Winning, Bullying, Children's Picturebook, Consideration for Others, Golden Rule, Manners, Picture Book, sherrill s. Cannon, Uncategorized on October 18, 2016 by Sherrill S. Cannon. Peter and the Whimper-Whineys is always a favorite! I love opportunities to share my books!! This entry was posted in Award-Winning, Book-Signing, Bullying, Children's Picturebook, Consideration for Others, Manners, Picture Book, sherrill s. Cannon, Uncategorized on October 17, 2016 by Sherrill S. Cannon. Thank You, Book Excellence Awards! This entry was posted in Award-Winning, Bullying, Children's Picturebook, Golden Rule, Manners, Picture Book, sherrill s. Cannon, Uncategorized on October 12, 2016 by Sherrill S. Cannon. The Golden Rule wins a Gold!! How nice to have a Gold for The Golden Rule!! Gold for The Golden Rule! This entry was posted in Award-Winning, Behavior, Bullying, Children's Picturebook, Consideration for Others, eBook, Golden Rule, Manners, Picture Book, sherrill s. Cannon, Uncategorized on October 3, 2016 by Sherrill S. Cannon.